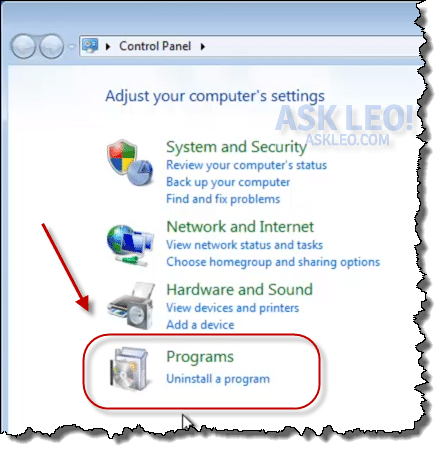 Uninstalling Software You Don't Need - Ask Leo! One way to reclaim space (and occasionally even performance) is to uninstall software you don't need. I'll review two important places to help you do just that. It’s not at all uncommon for a computer to accumulate quite a collection of software over time. Applications, utilities, Windows features, and who knows what else all accumulate over time to take up space and resources from our machines. It’s also not uncommon for much of the software installed on our machine to go unused and unneeded. Perhaps we stopped using a specific application. Perhaps a trial version of some software remains. Perhaps some software was installed as part of some other installation. The bottom line is that there are things we can uninstall. There are two places we need to look. Before you start uninstalling programs, particularly if you’re not certain about some of the things you’re about to remove, please seriously consider starting with an image backup of your system. That way, if you find you uninstalled something you shouldn’t have, you’ll always be able to restore that backup image and continue as if nothing ever happened. If nothing else, it allows you to be slightly more aggressive, knowing you can always turn back the clock should something go wrong. The most common scenario that people think of when we say “uninstall” is to reverse the effects of a set-up program that was run on their computer at some point in time. Most of the time, that’s as simple as re-running the set-up program and instructing it to remove whatever software it had previously installed. On the Start menu, click Control Panel, and in Control Panel, click Uninstall a Program. Control Panel will present a list of the assorted software installed on your machine that can be uninstalled. Right-click the one you want to remove and click Uninstall. What happens next depends on the application. In most cases, a specific uninstallation program will run and remove the application after confirming that with you. Some applications will give you the option of leaving any customizations behind so that if you reinstall the program later, those will be preserved. What if it’s not in Control Panel? Most, but not all, programs you install on your computer will add themselves to the Add/Remove application or Programs list from which you can then uninstall them. If they do not, the first place to look is on any Start menu item that the program has added. Occasionally, programs will include an “Uninstall” menu item in lieu of (and sometimes, in addition to) the Control Panel item. In other cases, the original setup program will run, and display the uninstall option as an option to modify or change the installation. This allows you to add or remove features or components. In most cases, these types of uninstalls are actually quite sufficient and achieve the intended goal: freeing up disk space, and removing any auto-start utilities associated with the application. 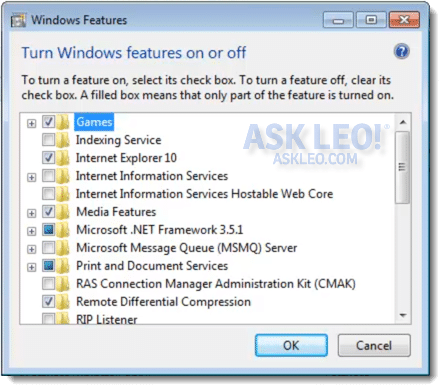 If the uninstall fails, or if, after the uninstall, there remain obvious traces of the application that cause some sort of problem, it might be appropriate to try a utility such as Revo Uninstaller, which can sometimes perform a more thorough removal of a program. But there’s another aspect to removing installed software that many people overlook. With the list of installed software displayed in Control Panel you’ll see a link to the left: Turn Windows features on or off. Click that to be taken to a long list of assorted features and components in Windows itself that can be controlled or removed. Many of the items are fairly clear and obvious. For example, unchecking “Games” will cause all of the pre-installed games that come with Windows to be removed. You can also expand that list (click the little plus sign in front of the checkbox) and pick and choose which games to keep or remove. Other items seem straightforward, but might not be. For example, if you don’t use Internet Explorer, it would be tempting to uninstall it. The problem is that because large portions of IE are used by Windows itself. as well as other applications, uninstalling it will either have little effect (perhaps removing only the icons) or will cause other programs to fail. My suggestion here is to simply proceed with caution. Uninstall or disable only the things you’re certain of. or consider leaving it alone until you do a little more research to understand the ramifications of turning it off. Which brings us to the biggest question of all. What can I safely uninstall? Sadly, this is an unanswerable question. It all depends on you, your computer, and how you use it. What can be removed differs from one person and one computer to the next. Applications you depend on and could (or should) never remove are so much space wasted to someone else. Components you have installed that you may not even recognize could be used by applications you depend on every day – or they could be completely pointless. The same is true for the list of Windows options you can control. One person’s critical feature is another person’s waste of space. Back up first, just in case you remove something you quickly decide you’d rather have kept. Keep your original installation media for everything, always, just in case you remove something you later decide you’d rather have kept. Research things when you’re uncertain. Leave things alone if you’re still uncertain. If you’re fighting specific issues, like disk space or computer speed, prioritize the applications at fault using disk space tools or CPU usage tools to identify what those applications are. Leave everything else alone. Is There a Way to List All Programs Installed on My Computer? - Unfortunately, there's no consensus on what it means to be an "installed program", or how to find them. Why Doesn’t Malware Appear in the Add/Remove Programs List? - Malware not showing up in the Add/Remove Programs list doesn't surprise me at all. After all, malware's success is based on its ability to hide from you! « Previous post: How Do I Tell Someone They’re Entering Their Email Address Wrong? Advanced Uninstaller Pro (an installed app) — http://www.softpedia.com/get/System/OS-Enhancements/Advanced-Uninstaller-PRO.shtml . Geek Uninstaller (portable) — http://www.softpedia.com/get/Tweak/Uninstallers/Geek-Uninstaller.shtml . Wise Program Uninstaller — http://www.softpedia.com/get/Tweak/Uninstallers/Wise-Program-Uninstaller.shtml . What happens when a program doesn’t show up anywhere, but is still preventing other programs from being installed. Specifically “WindowBlinds 7” It doesn’t show up anywhere, but nothing will uninstall it. When you try to install WindowBlinds8, you receive a message that you have to uninstall windows 7 but it is impossible. I can’t find any software that will uninstall a phantom program such as that. I am an everyman user of the computer and have only had one for 2 years if that. I am a senior and not tech savvy at all but trying very hard to understand the computer world. Ask Leo has been some help but mainly through osmosis. I read and listen but don’t understand but through repetition and time some things get obsorbed. In this article I went to my control panel and to “programs”. Fine – a big list of programs with odd names. Whoop di doo. Not one program means anything to me. No where to find an explanation of what they do, if they are installed on my computer or “saved”. I have no clue what a single program does or does not do much less how it can effect other programs or the computer. Same thing happens with comment ” DON’T OPEN ANYTHING YOU DON’T TRUST”. What sage advice. Of course none of us commoners know what any programs do much less if they might have bad things in them. I just plod along and If I get a virus I will just throw away my computer and get another. I have learned from Leo how to go back to previous time and reinstall old time line and that has saved me a couple times. The whole tech world purposely does not even tell what they are so they can keep us in the dark. Safari, Adobe, Adobe AIR, AVS4YOU, BING ,BONJOUR, Gaygan, Java, MSXML, Quick Time, Spotify. Yes I realize many of these are names for programs but give no clue what the programs do. Use Google to look up your programs, etc. that you have no clue about what they are for; just put what is (fill in name) in the search bar, and even if you don’t totally understand the answers, at least you can usually get an idea of what they are. Websites like www,pcworld.com or http://www.pcmag.com are good places to look for answers. You just have to look around on the web for info. Our church was donated a used computer, where the previous owner left everything including his personal tax returns on the computer. I started to look at uninstalling stuff and not knowing what some stuff was, I used Google to search for the program and find out what it did. After a while I gave up. There was nothing that I really HAD to save and the restore partition was still there so I figured it was simpler to just revert to factory. Google is a very useful tool for looking up terms and program names with which you are not familiar. Whenever you do an Uninstall, do a search for ‘all files and folders’ – search for both “Company Name” such as: ‘Adobe’ and then “Program Name” such as “Acrobat”, or “version identifier” such as: ‘7.0’, with the options “Search system folders”, “Search hidden files and folders” and “Search subfolders” checked. Delete all of those related files found. You should do this search and delete whenever you Uninstall any programs. It will remove lots and lots of leftover junk files and corrupted files taking up room on your hard drive. If you do so, you will find that just “uninstalling a program” leaves lots of garbage behind… the same goes for Registry files. If nothing else, they take up hard drive space. Bet you find them! The more you search the more you will find! I went through the “Technical Uninstall” of McAfee (Several PAGES of very technical uninstall instructions, including some registry editing). Then I did a search for any leftover files, then installed Norton, several years later I installed “Registry Mechanic”, it found several of the old McAfee files! I’m reluctant to endorse this agressive removal simply because it carries with it some high risk of deleting something that might well be important. you may have other software on the machine by the same company, for one example, that you could break by deleting too much. Honestly, this type of approach is rarely worth the effort and risk, in my opinion. On the other hand, if you must, be absolutely certain to backup first. I dont know why anybody would get rid of Revo to install Iobit Uninstaller. Revo is great. It does a more thorough job of uninstalling any programs. I used to have Iobit Uninstaller to do forced uninstalls on apps that werent listed in the Control Panel. But it wasnt doing the job. Iobit does not completely uninstall programs. You have to go in and manually clean up after it. Later I found another program – Puran Utilities Uninstaller, which does a though forced uninstall of apps not listed in the Control Panel. You just browse to the program and click on “Forced Uninstall”. it does a great thorough job. Thats what I use now, along with Revo. If you use Windows Media Player, DO NOT uninstall Internet Explorer. For some reason, WMP doesn’t work if you do (I’ve uninstalled IE three separate times, and each time it’s resulted in a failure of WMP). IE should never be completely uninstalled for a variety of reasons. It’s used by many other programs beyond just WMP. In fact it’s important to keep IE up-to-date even if it’s not the browser you use day-to-day. I need something like this I am new to computer so I would like all the help you can give me. Curious as to why Ccleaner is not mentioned here. I use it frequently with seemingly good results. The CCleaner uninstall function just runs the Windows uninstaller. 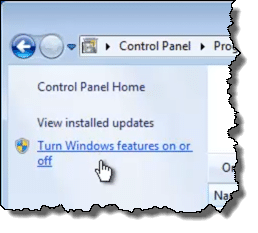 i want to uninstall software which is not display on control panel then what to do? Depends entirely on the specific software. There’s no single answer.